The newest member of our popular Head Knockers line is Marvel’s infamous Doctor Doom in his classic costume! 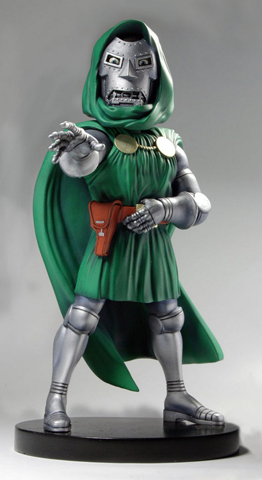 The Fantastic Four’s arch-enemy rules Latveria with a cold iron fist, and demands your complete obedience. He’s cast in resin and then hand painted for detail — nothing less would be worthy of the mighty Doom. Stands almost 9″ tall with bobbling head. A fantastic piece for old-school fans, and perfect for your desk or shelf.